Overfill each pepper half with meat and cheese mixture. Cut the dough to wrap around each pepper and seal all the seams. Poke several holes in the top of each popper. Bake in a pre-heated 375º for 25-30 minutes or until golden brown and the sausage has reached 165º. 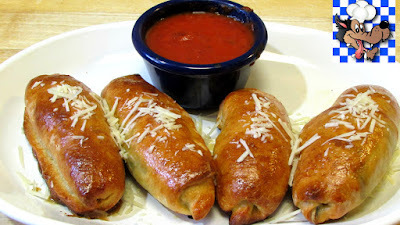 Sprinkle with additional Parmesan cheese and serve with pizza sauce for dipping.